The LC-130 is a ski-equipped variant of the Lockheed C-130 Hercules used in the Arctic and Antarctic. Aircraft in several versions were built by the Lockheed Aircraft Company. The first, delivered in the early 1960s, were originally designated C-130BL, but the designation was changed to LC-130F when aircraft nomenclature was changed by the U. S. Defense Department in the early 1960s. These aircraft were bought by the Navy Department to support the Navy’s Antarctic expedition that was on going at the time. The National Science Foundation bought the second set of aircraft as replacement aircraft. The Polar Program Division of the Foundation had assumed management of the Antarctic Program in the early 1970s. These aircraft were designated LC-130R and were delivered in two lots: the first lot of three in 1974 and the remaining two in 1976. The LC-130R has more powerful engines, has wing-mounted external fuel tanks and can carry a heavier payload than the LC-130F. The primary mission of the LC-130 is supporting the scientific community in the Antarctic by transporting cargo and personnel from the McMurdo Station to various field stations and camps, including the Amundsen-Scott South Pole Station. The aircraft are equipped with fully retractable skis that allow the aircraft to land on snow and ice as well as on traditional runways. The aircraft have provisions for using jet-assisted-takeoff (JATO) rockets, four on each side of the aircraft, that are used when the LC-130 operates from rough, unprepared snow surfaces or when shorter takeoff runs are needed. Originally the expended rocket bottles were jettisonable, but due to a couple accidents when a bottle detached from the aircraft during takeoff, the mounting provisions were changed so that the bottles could not be released in the air. The Navy Antarctic Development Squadron Six (First designated VX-6, then VXE-6 from 1969) originally operated the LC-130 aircraft. Initially, VXE-6 was home based at the Naval Air Station (NAS), Quonset Point, Rhode Island and later at the NAS, Point Mugu, California. 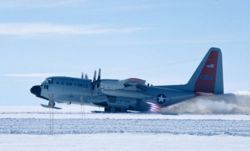 Operation of the aircraft was transferred in the 1990s to the 109th Airlift Wing of the New York Air National Guard when Navy support of the Antarctic program was terminated. Over time, a number of LC-130's have been lost due to accidents. Three LC-130 aircraft crashed in the early 1970s. An LC-130F taxied over a snow berm during a storm while maneuvering for take-off and was lost to fire in early 1971. Another LC-130F crashed in Victoria Land in late 1971 when the nose landing gear collapsed following a JATO malfunction during an open field takeoff. This aircraft was recovered in 1987. However, during the recovery effort an LC-130R crashed, killing two crewmen. In addition to the loss of the crewmen, an airborne scientific capability was lost as this LC-130R had been modified to do scientific work. The original LC-130R crashed while landing at Amundsen-Scott South Pole Station in 1973. In the 1974/75 season during an open field takeoff on Dome C a JATO bottle on a LC-130F came loose and damaged the wing and one propeller thus causing an aborted takeoff. A fire in the wing caused further damage to the wing. A LC-130R was used to rescue the scientists and aircrew. Reluctant to use JATO, the nose gear of the LC-130R collapsed in the rough ice/snow during the takeoff, aborting the rescue attempt. A third LC-130 finally rescued all the scientists and aircrew. After evaluating the situation the Foundation and Navy made plans to recover the two downed aircraft during the next season. This involved replacement of the wing on the first aircraft and of the nose landing gear on the second aircraft. Preparations were made during the off-season to accomplish the repairs. After temperatures had risen sufficiently the recovery operations began the next November. A large number of flights was needed to transport all the material to the Dome C site. As a LC-130F took off for return to McMurdo a JATO bottle came loose and again damaging a propeller. Thus, Dome C became the home of three damaged LC-130s. As the damage to the last LC-130 was relatively minor compared to the others it was repaired first. Through extraordinary effort the repair team and supporting maintenance and aircrews all three aircraft were repaired and recovered from Dome C.
Currently all LC-130 aircraft are operated by the New York Air National Guard. There are three versions. Four aircraft are LC-130H-2. Three are LC-130H-3. And three are LC-130R (Navy Version) which have been converted to Air Force LC-130H-2. This page was last edited on 6 March 2007, at 11:22.